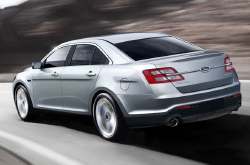 Read a full review of the 2013 Ford Taurus below! This award-winning passenger car continues to be one of the most popular vehicles in its class for several reasons. Not only does it meet all of the usual needs of most large sedan shoppers; it also exceeds those needs by offering modern amenities that one might find on more expensive vehicles. 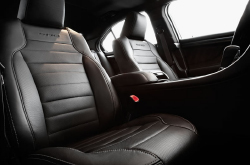 This is a big reason why hundreds of families and other consumers in need of large passenger sedans have chosen the Ford Taurus in Phoenix, Tempe, Mesa, Scottsdale and other surrounding cities. The Taurus offers a trio of characteristics that many full-size car shoppers are looking for, including a spacious and comfortable interior, roomy trunk and smooth ride. On top of this, it goes above and beyond what many large car shoppers are looking for by offering a long list of standard and available high-tech features, including items that enhance convenience, safety and entertainment. If you've been thinking about purchasing a Ford Taurus in Phoenix, read more to learn all about its modern amenities, powertrain options and safety features, among many other things. Simply scroll down past the video to start reading about the new Taurus at Peoria Ford now! When considering the 2013 Ford Taurus next to the 2013 Hyundai Genesis, Chrysler 300, Toyota Avalon, Buick LaCrosse and the Volkswagen Passat, and you can see that the Taurus trumps those autos in loads parts. Check out the hightlights below. Take a peek inside the 2013 Taurus - view video now! Peoria Ford auto repair service in Phoenix is only a click away! Your Ford deserves to be treated in the best way possible - that means Ford factory- trained technicians, trustworthy 2013 Ford Taurus parts, and the tranquility that comes from a 12-month service work warranty. If you neglect getting topnotch repair work, your Ford Taurus's health might wilt, so get it to the helpful mechanics at Peoria Ford. Whether you're on the hunt for cheap transmission repair or less tedious work like timing belt replacement or standard oil changes, we'll take care of it! And these things are just a small part of the jobs we do. Make a smart choice when selecting a spot to have your Ford Taurus repaired, and remember: At Peoria Ford you can anticipate getting professional service and nominal prices on Phoenix car repair. Check out our service specials by clicking on the link below. Consumer Guide says the new 2013 Taurus is "smooth, quiet, refined, and surprisingly engaging to drive." And its sophisticated performance is just a small part of what this IIHS Top Safety Pick has to offer. When you own the 2013 Ford Taurus in the Phoenix metro area, you'll enjoy a comfortable, well-appointed interior and a trunk with lots of space that can fit things like golf clubs and other large items. Visit Peoria Ford to test drive the Taurus and learn about up-to-the-minute manufacturer incentives that could help you save hundreds or possibly thousands on your next purchase at our dealership. To receive notifications about vehicle specials and dealership news stay in touch on Facebook or Twitter; additionally, you can subscribe to Peoria Ford's monthly newsletter, which includes information about sales events, articles about the latest Ford models and other fun news. It's worth the drive to Peoria Ford, where you'll find some of the best deals in town on Ford's freshest lineup. We're conveniently located at 9130 W Bell Road and are proud to serve Mesa, Tempe, Avondale, Glendale, Scottsdale, Litchfield Park and other nearby cities.